JohnRoscigno.com: Best ice cream sammich ever! 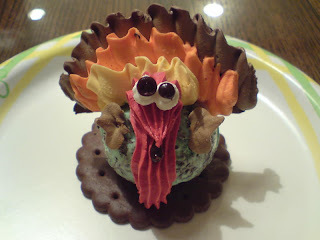 Instead of birthday cake for my mom's super early birthday party, we got ice cream turkeys. Kinda awesome. They were super cute and really tasty (being ice cream and cookie and frosting). This afternoon my dad, Teenie, Joe, and I went to the new local black light miniature golf course in SCV. It was quite a bit nicer than the Putting Edge, but amazingly STILL had the problem of bad parents not watching their kids playing on the hole directly behind us. The drive back to Azusa was nice, little traffic, and Joe was left with a boat-load of left-overs and books to finish up the semester with (and the $2 he found in the parking lot...lucky).